Downtown of the 50’s and 60’s had many interesting small clubs and restaurants. Several of these were owned by the infamous Balistrieri brothers, Frank and Peter, including the Downtowner, Melody Room, Tower, The Scene, and Gallagher’s. The Balestrieri’s were well known as the “Milwaukee Mob” and owned many smaller hotels, strip-clubs, and taverns downtown and on the east side. Despite their main business of organized crime they operated these businesses that were iconic parts of mid-century Milwaukee history. Gallagher’s was located at 829 N. 3rd St. and was the tavern portion of the Gilpatrick which was torn down in 1941. The one-story tavern was re-roofed, remodeled and began its new life. It was originally called the White Pub in the 1940’s, then when the Balistrieri’s bought it in 1954 changed to the Beachcomber before a lawsuit by the owner of the national chain forced the name change to the Trade Winds. Again, that name caused a lawsuit because it too was a popular national chain of restaurants. 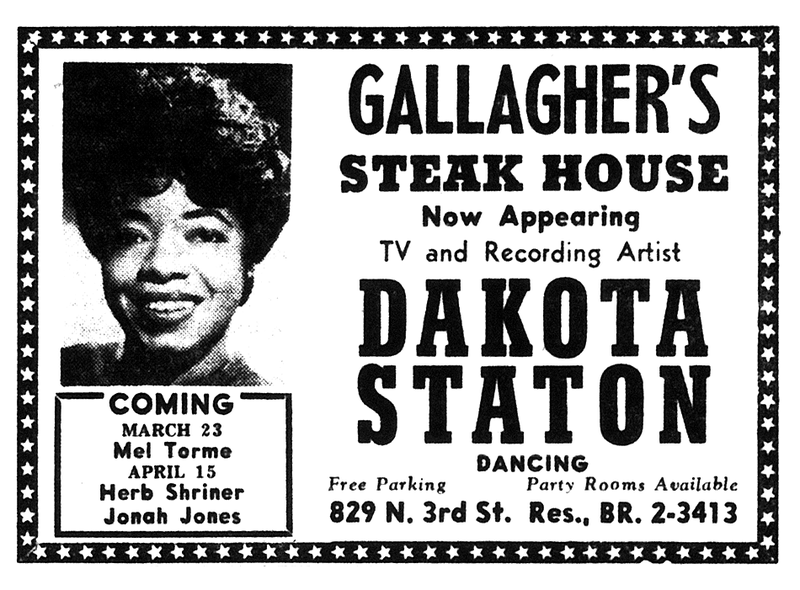 It finally became Gallagher’s in October 1958 and changed to a steak house/supper club. It is not know if it was an official franchise of the New York Gallagher’s although there appears to be a pattern in the choice of names. The idea for Gallagher’s was to try to bring in a younger crowd for dinners downtown by offering quality entertainment and bands from national circuits. It featured blues and jazz groups such as Jonah Jones, Dakota Staton, Oscar Petersen, Lonnie Mack with Troy Seals, Mel Torme, and many others. Not all of them were playing standard dinner music but they drew in the crowds and added to a robust live entertainment and club scene. 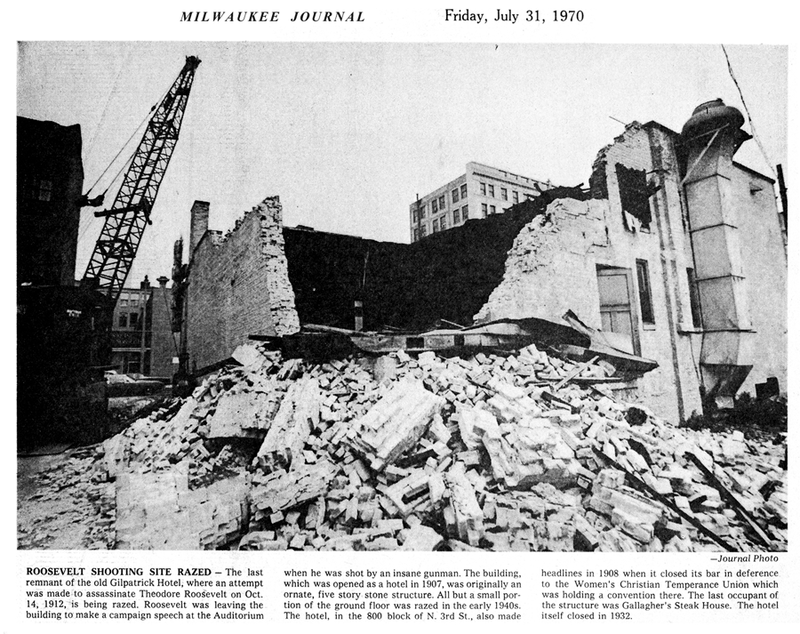 Gallagher’s closed in October 1969 and the building was torn down in July 1970. 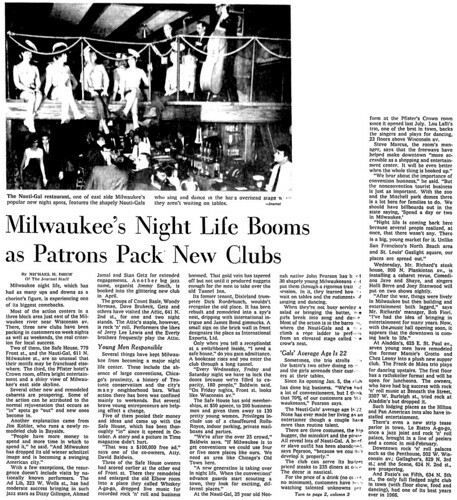 This article from the Milwaukee Journal of February 23, 1967 talks about several of the newer night clubs that opened in downtown. They range from music clubs to dance, and themed clubs. One that still remains is the Safehouse which opened in 1966. 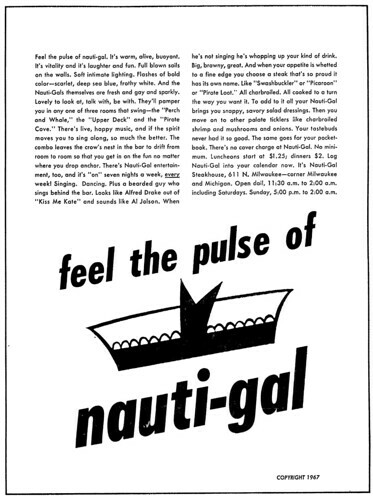 The Nauti-gal was something which hopefully didn’t last too long. It seemed like something that was the epitome of the 1960’s. Dancing waitresses would be different to put it nicely. This ad from the Nauti-Gal in the March 5, 1967 Milwaukee Journal explains the idea. Are you ready?